I like the cart on the left! Definitely cart on the left. This will be an instant purchase for me as soon as it becomes available. Will there be a box? I prefer the cart on the other left. The one that's not trying to look like it's officially licenced and manufactured by Atari Inc. Guess I'm the odd one out. Grafixbmp, you are obviously putting a load of effort and meticulous attention into this project. It's going to amazing, whenever it's ready. As it stands now, i'm only after the first level until i'm not the only one working on the project. The graphics engine is the first priority for me. But I have to think about the game engine itself as well so that the code for the graphics can hit all the things that the game engine needs. Love havin' an Apple //e again! That castlevania port is making my mouth water. Reminds me of Montezuma's Revenge, just with an attack. Are you hiring recruits so to speak? My knowledge in programming is at a novice level and only Batari basic, but I've done beta testing/feedback before for other people who create games. I like the cart on the right. The cart on the left looks to bland and boring, and doesn't stand out enough against other Atari games. The one on the right screams "epic game inside!" The one on the right uses artwork and the logo from later games that this remake is not based on. The one on the left uses the correct art. I know, but it's still Castlevania and it still has the creepy aura. Also, if this game gets finished I think it should be worthy of an artist doing new artwork. Also, if this game gets finished I think it should be worthy of an artist doing new artwork. Yep, then no one will have to worry about an artist suing. New artist = fewer problems. I made you some artwork. I tried to capture the intense gameplay as well as the horror into this image as a painstakingly colored it pixel by pixel using one of the most advanced free with every comp editing programs I've ever used. NICE!!!! Though, we should be patient and wait for any real updates.. that picture is pretty funny though. Ewww, now that I look at it, Dracula's head is kinda cut off on there's a glow on Simon's. If anyone likes it at all, I can fix those. Here's another label art submission. 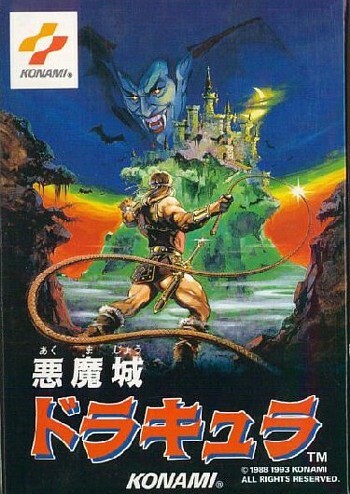 The image has been flipped as it was on the MSX "Vampire Killer" box art. I hope that if the game ever gets finished and put on a cartridge, the label isn't just ripped directly from another version and put on an Atari Cartridge. Even through the label maker. This will deserve it's own art, or modified version of existing art. 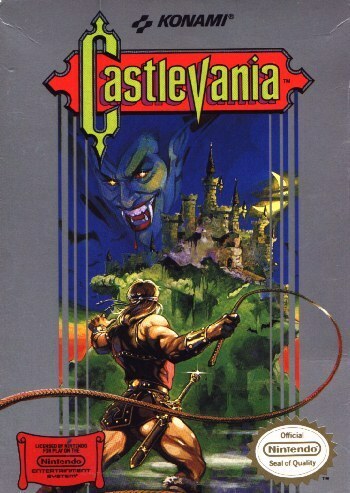 If anyone has any drawing ability, it would be absolutely OUTSTANDING if someone could redraw the Castlevania logo using pastels and make it look more like Atari cartridge art. 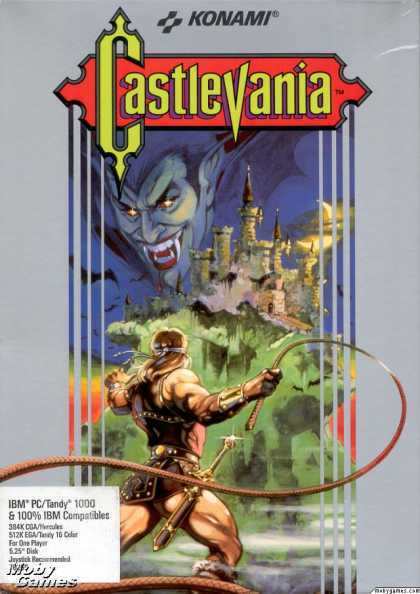 All of the ports of the original Castlevania used the same art so this one should too. I went ahead and spent some of my precious birthday moments to make you a special label. Feel free to rename the game in honor of me. Half those links didn't work. Anyway, all them have the same general art, but some are lighter/darker, mirrored, etc. I think if someone went over the image with pastels and made it look like a genuine Atari cart art it'd be excellent. I hope that was a special birthday LMFAO. Did you know it was his birthday? Yeah, it's his birthday. I am astounded at how good this looks. What surprises me the most is how good the background seems to read. Still creepy! Mr. Grafixbmp if you ever put this into a cart I will be your first customer. Good luck! !